Free Photo Book from Hot Prints! 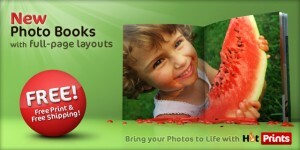 You can create your own full page photo layout books here! Click on "Make your own Hotbook" link on the right. Then register and you can start. You also get free shipping! Pictures are easy to load and you'll get a FREE photo book every month! Nice!